We’ve expanded our range of Nautilus connectors with the introduction of a IP67 right angle SMA connector. The right angle version is bulkhead mounted an includes an external o-ring to prevent ingress through the panel, coupled with an internal seal which stops moisture entering through the centre contact achieves an IP67 rating. The Nautilus connectors are offered as part of a full cable assembly, the most popular options for the other end of the cable assembly are Hirose U.FL or IPex MHF connector types which normally mate with Wi-Fi, GSM or GPS communications modules. However we offer a huge variety of connector options for the other end of the cable, all the way from tiny micro connectors, such as I-Pex MHF4, through to larger bulkhead connectors, such as N and TNC. We can also supply in many different coaxial cable types. This link takes you to the main GradConn website and the specific resource page for the right angle SMA connector, where you’ll find a PDF drawing, 3d model and links to build and request cable assemblies. We have a wide range of Nautilus IP67 rated SMA connectors, with many straight bulkhead versions and also PCB mounted variants. The full range of cable mounted waterproof connectors, including SMA types here. PCB mounted SMA connectors are here. Customers often ask us about SMA mounting, industry terminology can be confusing. This guide to help you understand how to mount a rear mount SMA connector in a panel quickly and easily. There’s often confusion about front and rear mount SMA connectors. Rear mount means that the main body of the SMA connector, including the large nut is mounted inside the panel cut out, the washer and nut are screwed up outside of the panel. Rear mount SMA is the most common mounting method in the market place today. See our front mount guide here. Nautilus is a range of IP 67 & 68 rated connectors, find out more at our Nautilus web pages. Finally, if you require any help or advice with front mount SMA connectors then contact GradConn. Gradconn will be exhibiting our new range of Nautilus connectors at the Motiv8 RF and Wireless Design forum on June 14th 2016 in Cambridge, UK. Click on the above links to register for this event. We’re looking forward to seeing you there to answer your questions and help solve your design problems. Our product range include a wide range of connectors for wireless solutions with a huge range of coaxial cable assemblies and SIM card connectors. The Nautilus range of IP rated cable assemblies will be a particular focus for this event. We believe these will be of interest to Engineers working on designs in a wide range of applications including Remote Sensing, Asset Tracking, Metering, Ag-Tech, Security and many others. Waterproof interface connectors mounted in an enclosure feature an internal seal and O-Ring which prevents ingress of water and particles through both the inner contact and the panel. We already have a number of the most popular assembly combinations available online. We can also develop new assemblies to suit your project. We look forward to discussing these with you at Motiv8 RF and wireless design forum. Alternately, feel free to contact us regarding your requirements or use our RF cable assembly builder to configure the assembly you need. GradConn have created a guide to explain bottom entry board to board connectors, customers are often confused by the variety of board to board connectors female sockets on offer. GradConn have forty five vertical PCB sockets with leaf spring contacts in the range. Where sockets are described as dual or bottom entry they may accept header pins from underneath the PCB. Customer must drill holes in the PCB to achieve this type of design, details of the required PCB cut-outs are shown on GradConn’s product drawings. You can see an example in the ‘bottom entry socket’ image above. Using a PCB socket in bottom entry mode allows customers to connect from the underside of the PCB, this allows very low profile parallel PCB stacking solutions, which depending on pitch might be as low as 2.00mm to 3.00mm above the PCB. It also allows designs which pass through the PCB to connect more then two printed circuit boards in parallel orientation. You’ll find more information about that here. Both surface mount and through hole connectors have bottom entry options. That’s our guide to bottom entry board to board connectors finished. We’ll be producing more of these guides in the weeks and months to come. Please ask us if there any thing special you’d like us to cover. We hope you find GradConns front mount SMA connectors mounting guide useful! Customers often ask about SMA mounting, industry terminology can be confusions. This is the first in series of guides to help you understand how to mount SMA connectors in a panel quickly and easily. There’s often confusion about front and rear mount SMA connectors. Front mount means that the main body of the SMA connector including the large nut is mounted at the front of the panel cut out, with the washer and nut screwed up from inside the panel. This style is used to provide a tamper proof solution, as the connector cannot be unscrewed from outside the panel. See our guide to rear mount connectors. 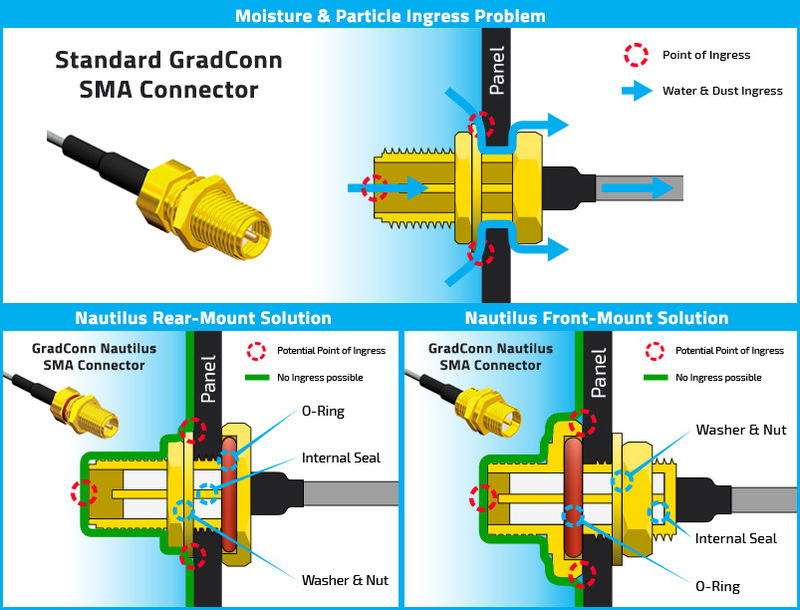 GradConn offer front mount SMA connector solutions in three options, standard SMA, Nautilus RP-SMA (reverse polarity) and Nautilus SMA. Nautilus is a range of IP 67 & 68 rated connectors, find out more at our Nautilus web pages. Looking for a waterproof SMA jack connector? Our customers often seek to prevent ingress of moisture and particles into SMA jack connectors. The applications range from splash proof, up to fully submersed underwater. Working hand in hand with customers, GradConn developed a waterproof SMA jack connector. The Nautilus range of coaxial connectors offers IP67 & IP68 testing to 5 meters depth. Testing also extends to particle ingress IP6x and pressure. The image above shows the point of entry for water ingress when the connector is mounted in a panel. The ‘problem’ section shows water ingress through the center contact and also thru the panel cutout. This is the most popular type of SMA, with the washer and nut screwing up on the outside of the panel. The Nautilus solution contains both an external and internal O-Ring to prevent ingress. Using this type of connector allows the panel to be effectively tamper proof, as the washer and nut are tightened inside the panel. A range of other Nautilus waterproof connector types are available, such as RP SMA, BNC, TNC and RP TNC. Front and rear mount options are available, an example of front mount and rear mount is shown in the image above. Got to http://www.gradconn.com/Products/IP-Rated-Coaxial-Cable-Assemblies to browse existing cable assemblies, build a custom cable and download detailed test data. Check out GradConn’s new pages, aimed at helping customers understand board to board connectors. The first one deals with Polarization and shrouding on board to board connectors, it shows how polarized connectors work and provides useful links to GradConn’s parametric search. Customers choose to use polarized connectors in applications where it’s important that the two mating connector halves are plugged together correctly, IE pin1 to pin1. Connector polarization is achieved by a variety of methods, for larger pitch connectors, such as .100″ pitch contact spacing the normal arrangement is for the header with males pins to have a shroud, with a key cut into one wall, normally the longer side of the rectangle. See example in the image above. The mating socket has a raised bump, this ensures that the connectors may only mate in the correct orientation. For finer pitches, such as .050″, by definition are smaller and have thinner plastic sidewalls, extra keying features are built in. For the PCB header, there’s a key on each shorter rectangular end, matched by a different sized pegs on each end of the mating PCB mounted socket. In additional an off center top key provides extra polarization. If you seek any further information or help with board to board polarized connector applications contact GradConn. Need board to board connectors on the go? Looking for board to board connectors on the go? www.GradConn.com is now optimised for handheld devices. Use a wide variety of tools to help you find the perfect board to board connector solutions. Flowing filters allow you to navigate the huge range of board to board connectors on offer, content is re-sizes dependent on the screen size you are using. Large buttons allow easy call to action, including document downloads and ordering free samples. guides for PCB mating in co-planar and parallel orientation, these guides help you find perfect connectors for your applications. A section on custom board to board connectors shows examples of specials created for customers. Send a cross reference requests to ask GradConn to cross competitors parts. Some of the great existing features didn’t change, basket functionality allows you to select, review and order samples or a quote. You can easily search for board to board connector mating halves, which we know can sometime be tricky on our competitors sites. We hope you enjoy using the new site, however, if you can’t find the exact solution you seek, then contact GradConn for advice from our board to board connector expert. Working in conjunction with customers, GradConn developed a range of waterproof interface connectors with internal seal and O-Ring to IP67 & IP68, which prevents ingress thru the inner contact and thru the panel. The connectors have been tested to IP6x, IPx7, IPx8 for both 1 metre and 5 metres underwater, all certified test data is online here. Many Nautilus cable assembly drawings are online, however if the option you require is not, then use GradConn’s online coaxial cable builder to quickly enquire on exactly what you need. MOQ’s are low and prices reasonable. Click here to see the full range of IP67 coaxial cable assembly or contact your local GradConn sales office now. GradConn’s new 1.2mm pitch wire to board connector range offers mated height of 1.45mm above the PCB. Its mating orientation makes it suitable for designs where space is at a premium. Available in 2 – 6 positions, horizontal PCB headers are polarised to avoid mis-mating, housings and headers are plugged together from above, which is easier for operators and allows mating in applications where a traditional end-to-end mating may not fit. Examples of applications are Solid state lighting, notebooks and GPS. To prevent mismating, the housing polarising ‘rib’ allows mating with header only in the correct orientation. The mating connectors lock together with an audible click, which aids assembly. Gold plated contacts are rated at 1.5A for mating headers and sockets terminated with 28AWG diameter cable . WB06-DA has an operating temperature range of -25°C to 85°C and is packaged in tape and reel. Cable assemblies are available to suit your design, including connector types from other manufacturers at the other end of the assembly. Build a custom cable assembly using the cable builder tool. Go to www.gradconn.com to download drawings, 3d models and specifications. If you require any help or design advice on 1.2mm pitch wire to board connector contact GradConn.